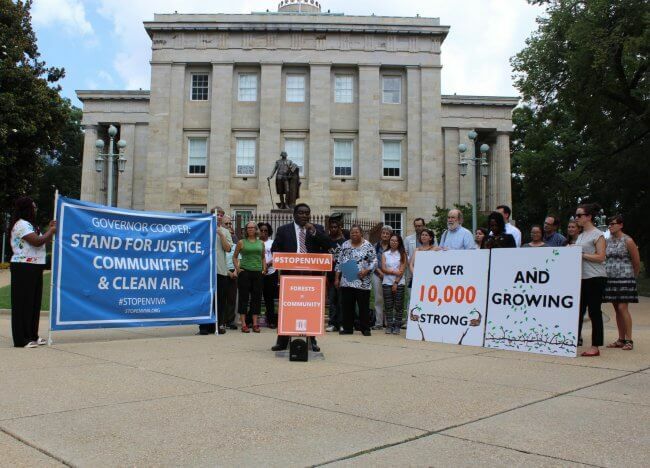 2017 was a year of optimism for many in the North Carolina climate justice movement. We had a new governor in office who offered greater support for environmental issues and a new Secretary of the NC Department of Environmental Quality with an agenda to prioritize the voices of rural and frontline communities at the table. At Dogwood Alliance, our partners and supporters made 2017 the year we put the issue of wood pellets and environmental justice on the map. Your activism and support brought critical attention to the many threats of the industrial-scale wood pellet industry. We are greatly disappointed that despite widespread backing from his constituents to take action on Enviva, Governor Cooper chose to remain silent. 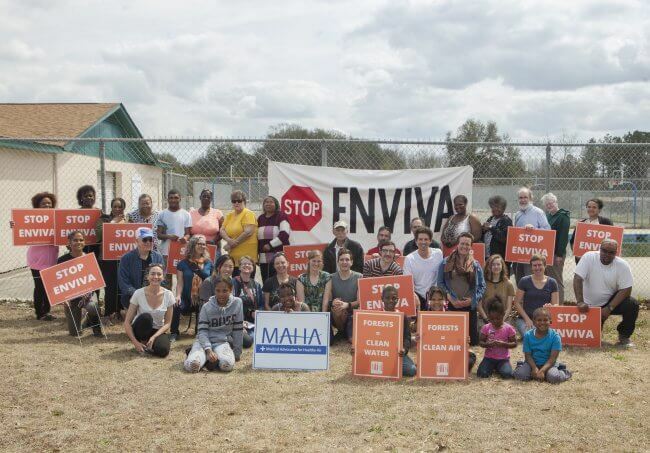 Enviva is moving forward with construction in Richmond County, putting at risk the health and quality of life of neighboring residents and taking North Carolina further down a path of false solutions. This year, we are calling on Governor Cooper to take a stand. We know that investing in truly clean energy and promoting businesses that support healthy communities and protect our state’s forests is the path to a prosperous and just future, and we continue to stand with Governor Cooper in this vision. Yet a year after taking office, Governor Cooper is falling short on his commitments to justice and the climate. 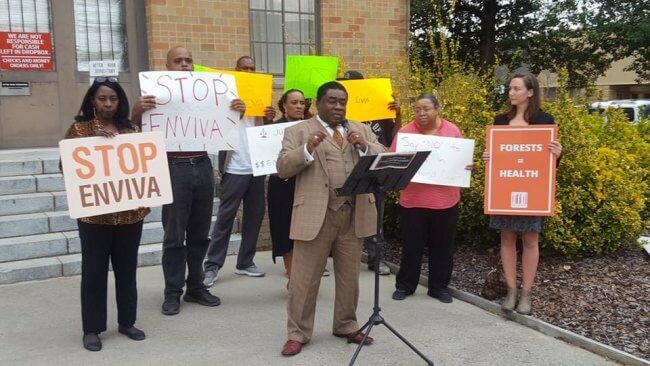 In Richmond County, NC, the Governor’s constituents are fighting the legacy of his predecessor, opposing an Enviva wood pellet facility that was brought in without proper public notice, will disproportionately impact the local Black community, and will take our state and country backwards on climate. Governor Cooper had full authority and the backing of his constituents to stop this plant. But the Governor remained silent on this issue. A few months later, the Governor once more had an opportunity to stand by his vision, and once more, he fell short. The Atlantic Coast Pipeline was recently granted its water quality permit, paving the way for countless acres of destruction and hitting our most vulnerable communities with a dangerous and unwanted role to play in energy production. In the face of big money and corporations, Governor Cooper was silent when his constituents’ clean air and clean water was at stake. It’s time that Governor Cooper break the silence. Do you stand for forest destruction and pipelines, or do you stand for innovative solutions that will take our state forward? Governor Cooper: Break the silence on Enviva. Where do you stand? Across the state, the voices of Governor Cooper’s constituents have been clear. In 2017, North Carolinians called on Governor Cooper to stop Enviva in Richmond County. In July of 2017, Dogwood Alliance delivered to Governor Cooper and NC Department of Environmental Quality (NC DEQ) a petition signed by more than 10,000 people and a letter opposing the plant signed by more than 50 NC organizations. Medical Advocates for Healthy Air sent a letter to Governor Cooper that was signed by health professionals who were concerned about the public health impacts of wood pellet production. More than 600 people called the Governor’s office opposing the construction of the Richmond County Enviva wood pellet facility. Dogwood Alliance, Southern Environmental Law Center, and Concerned Citizens of Richmond County met with NC DEQ and with the Cooper Administration. More than 100 scientists sent a letter to Governor Cooper opposing the wood pellet industry, and two prominent scientists published an op-ed in NC papers. The Concerned Citizens of Richmond County was represented by the Southern Environmental Law Center in a lawsuit against DEQ for issuing a permit with an incorrect address and failure to provide adequate public notice. Rather than giving citizens the public hearing they are entitled to, NC DEQ chose to fight the Citizens of Richmond County in court. In an unprecedented move, a judge dismissed the case before it ever came to court, once more denying local citizens their right to have say. Despite this, the Governor has remained silent. It is time to break the silence on Enviva. In 2018, Dogwood Alliance is asking Governor Cooper to stand for the environment, stand for justice, and stand for forests. It’s time to step up and make your position on the environment known. I am our Program Chair for the PPG Sierra Club. Our group has expressed an interest in your plight. Is there anyone who would be interested in coming to Greensboro and speak about the pellet factory at one of our monthly meetings? Hi Linda! That is great, and I would be happy to talk to you more about this campaign and how we can work together. You can email me at [email protected]. Thanks!